Pity the rodent that is Canada's national symbol. The beaver turned 25 last month, but no one seems to have noticed. March 24. That's the day in 1975 that the Beaver Bill was passed. A state senator in New York was about to introduce legislation declaring the beaver to be the New York State animal. Sean O'Sullivan, Tory MP for Hamilton-Wentworth, quickly introduced a private member's bill in the House of Commons, declaring Castor Canadensis as a Symbol of the sovereignty of the Dominion of Canada. Joe Clark seconded it and royal assent followed. But, on the same day 25 years later, members were completely silent on the issue. The House of Commons marked National Epilepsy Month, World Tuberculosis Day and Greek Independence Day: After 400 years of oppression from the Ottoman Empire... Not a word about the beav. It's not as if the beaver doesn't deserve our attention. Between 1650 and 1850, the beaver led Europeans to colonize North America, drawing fur traders ever deeper into the continent, in search of pelts that were prized in China and for hats that were the rage in Europe. For a century and a half, the standard of currency was not cash, but beaver skins. Natives respected the beaver. A beaver robe tossed over a young couple marked them as man and wife. Native legend said that beavers had originally been endowed with speech. Beaver bones were never fed to dogs, but were returned to the pond that had been the beaver's home. On land, they lumber like sumo wrestlers. In water, they're torpedoes. Beavers can swim underwater for up to 15 minutes. They secret a substance which contains the same compound found in Aspirin, and can be used to treat pain. The ultimate recyclers, they eat their own stools to absorb every possible nutrient. Little boys find this totally charming, says Alison Beal of the Fur Institute of Canada. Today, typing beaver into an Internet search engine draws hundreds of hits, few having to do with the critter that built the nation. The most important mammal in the country does not grace the Canadian $100-bill or even the ten or the five, but the lowly five-cent piece. Even then, the beaver got the boot during the Second World War, in favour of a victory torch. It was replaced again in 1951 by a design to commemorate the naming of nickel; and during Expo '67, it was replaced by a hare, to celebrate fertility, new life and promise -- fitting for the 60s, but a slap in the face to the beaver. Even in French, the beaver gets no respect. Castor was the name assigned to buck-toothed French children in school before braces gave everyone perfect smiles. Castor was also the nickname Jean-Paul Sartre gave to Simone de Beauvoir, his partner in life, and was probably the best reason -- better even than his serial infidelities -- for her to leave him, though she, of course, never did. He called her Castor because she was hardworking. Trapped, according to some reports, to near extinction by the end of the 19th century, the beaver population has rebounded today to an estimated 18 million across North America. It is considered a pest by many cottagers and can even be dangerous. In 1992, a beaver dam burst, flooding train tracks near Nakina, 250 kilometres northeast of Thunder Bay, and derailing a CN freight train. Two crew members were killed. Approximately 300,000 beaver pelts were sold at auction in Canada this year, down from 600,000 in the heyday of the 1980s, before animal rights activists turned people from wearing fur. It remains one of the most popular furs in the world. 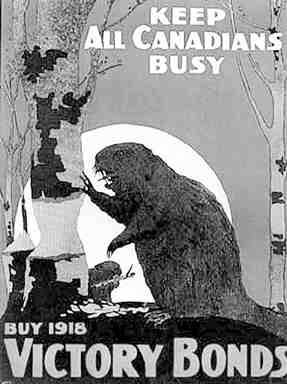 The Beaver, it must be said, did not allow the anniversary of its rodent namesake to pass unnoticed. It ran a short column on the beaver, explaining why no one considered celebrating the occasion.